Karen Dawisha (1949-2018) was the former Walter E. Havighurst Professor of Political Science in the Department of Political Science and the Director of the Havighurst Center for Russian and Post-Soviet Studies at Miami University. She died on April 11 at the age of 68. Karen is survived by her husband, Adeed Dawisha, their two children, Emile and Nadia, and grandson Theo. 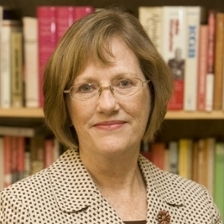 Karen Dawisha was the first Walter E. Havighurst Professor of Political Science in the Department of Political Science at Miami University in Oxford, Ohio, and the founding Director of the Havighurst Center for Russian and Post-Soviet Studies. Dr. Dawisha received her Ph.D. from the London School of Economics in 1975 and taught at a number of British and American universities before coming to Miami in 2000. In addition to establishing the Havighurst Center, she did research and taught in the areas of post-communist transitions and Russian politics. One of the projects she most enjoyed at the Havighurst Center was the Silk Road Project. Dr. Dawisha was the Principal Investigator for two grants from the Department of Education and Fulbright-Hays for the development of new courses that extended the reach of Middle East, East Asian and Eurasian Studies at Miami University into Central Asia. As part of that curricular development, she organized a 7-week trip for 15 faculty from western China through Central Asia to Turkey. You can see the website for that trip, and other Silk Road related activities at http://www.orgs.muohio.edu/silkroad. Dr. Dawisha's final book, Putin's Kleptocracy: Who Owns Russia? (Simon & Schuster 2014), chronicles the rise of Vladimir Putin during his time in St. Petersburg in the 1990s. With painstaking research to support her claims, Dr. Dawisha exposed how Putin's friends and coworkers from his formative years have accumulated mass amounts of wealth and power. Dr. Dawisha was featured in the New York Times, The Economist, The Wall Street Journal, and Foreign Affairs. She spoke at the Woodrow Wilson Center, U.S. State Department, and the Hudson Institute. Putin's Kleptocracy: Who Owns Russia? Simon & Schuster, 2014. "The West Is Ignoring Some Unpleasant Truths About Putin." The Moscow Times. 26 Feb. 2015. "Bad-Mannered Russians in the West." The New York Times. 04 Dec. 2014.